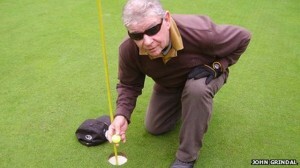 Jim O’Brien, 71, who lost his sight as a child, is believed to be only the third totally blind person to have hit a hole-in-one in England and Wales in the last 20 years. Mr. O’Brien achieved the feat on the sixth hole at Hindhead Golf Club in Surrey, England on Wednesday (October 9th). The retired charity fund-raiser was taking part in a tournament with other blind players, guided by sighted coaches, when he struck lucky on the three par, 139 yard long hole. The England and Wales Blind Golf Association has been holding the one-day tournament at the club for a number of years. The blind players are helped by a sighted caddie or guide, who lines them up for shots. Mr. O’Brien, who has been unable to see since he was a child, was helped by his guide John Grindal. Chris Donovan, the club’s secretary, said it was an “amazing achievement”. Mr. Donovan added the odds of a fully-sighted golfer hitting a hole in one were between 12,000 and 14,000 to one. Neil Baxter, chairman of the England and Wales Blind Golf Association, said: “It’s very, very rare and Jim is totally blind. “We’re all delighted about his hole in one. “As far as we know, he’s the only the third totally blind golfer to get a hole in one in England and Wales.